We followed Matt and Cheryl through the rain to a little restaurant located in the center of Stonewall Oklahoma. The kids had given up hope of hunting the morning and now were just praying that the weather would let up for the afternoon. It was only a 3 day hunt, and Pat Jr. knew that nobody hunts until Matt gets his hog. Like his hunt in '05, this was Matt's special hunt and we would all be there for him. We had a hearty breakfast and by the time it was over the rain had let up. The kids were pumped. Matt and Cheryl agreed, it was ok to head out. 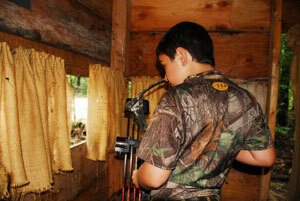 We got dressed and practiced a bit before heading out to the same blind Pat Jr. had killed his hog from in 2005. It was a small wooden box with burlap curtains. We fit a lot better two years ago, seems all four of us have "expanded" a bit since then. Like last time, we are hunting over corn which is thrown down in a row in front of the blind. From that point forward it's a waiting game. But we didn't have to wait long, hogs were trickling out of the woods and following the road straight in toward our little blind. I could tell Matt was nervous, but focused, as the first small group of hogs appeared in the window in front of him. He asked if he could draw but it was too soon and I told him "no." The hogs appeared cautious and uneasy. Before they presented Matt with a shot, the hogs started to growl - a clear indication we were winded. They ran off. For the next two hours it was more of the same. 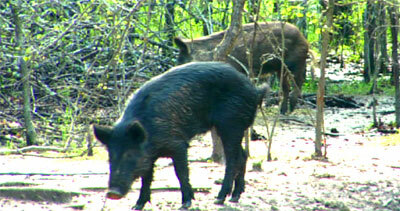 The hogs would get close, but when they got to a 45degree angle from either corner of the blind they'd start growling. There was no perceptible wind from inside the blind. The temps were in the high '80's with humidity levels around the same. I climbed out and soon realized that the winds, albeit faint, were swirling in the little bottom we were hunting. Rather than spook all of the hogs in the area, we opted to move to another blind. It was next to a meadow and at a high spot on the ranch. Matt thought the wind would be better here so we packed into that little blind and waited in the hot sun. It worked. 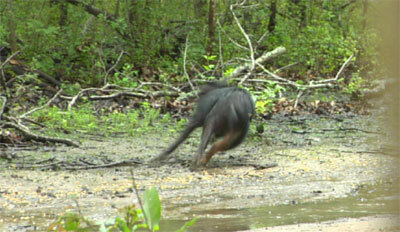 Several hogs came in but they stayed under the feeder some 20 yards away, and too far for Matt. He was frustrated but still having a ball. Three fallow deer came within mere feet of the blind and fed just in front of him. 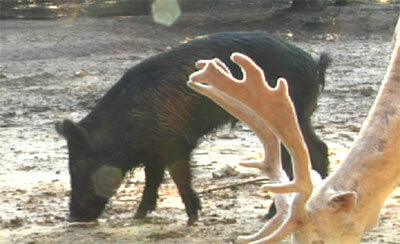 As they did, a nice boar came out and fed between them. Matt showed great restraint as he held off from shooting that boar. He had lots of shot opportunities but there was always a deer around so he held off. The boar left and he never got a shot. But several times it was so close that I could hear his breathing and his Muzzy was shaking a mile a minute at the end of his arrow. 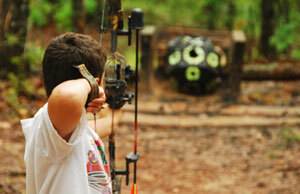 I loved seeing him get so excited about bowhunting. The sun was getting low so we decided it was time to pack it in. We saw close to 50 hogs today and we had some really close calls. Matt had a good afternoon. Tomorrow morning we'll give it another try.